Musings: What are you looking for in a teacher? Teacher, guru, or spiritual friend, what are you looking for? The spiritual path has many challenges. There are many things we need to learn or develop. A short list would probably include motivation, skills in meditation and prayer, contemplation, etc. Like music and painting, most of us learn spiritual practice better with someone, rather, than, for instance, by reading a book. When we interact with an actual person, we have to give expression to what we have learned. It becomes alive in us in a way that book learning often does not. In Buddhism we usually think of a teacher. In Catholicism, the comparable term might be spiritual guide. Whatever term we use, this person has a crucial role in our spiritual growth. Role? Actually, it would be more accurate to say "roles". I came up with a list of nine, probably not exhaustive or comprehensive, but perhaps a good starting point. Here are brief descriptions, in no particular order. A teacher is a person who imparts to you a given body of knowledge, skill or capability. In the spiritual context, this might mean the underlying philosophy, moral principles, and meditation methods. A teacher has to have experience and knowledge to impart and, as a student, your responsibility is to learn from the teacher. The teacher may touch into coach or therapist roles, but only to a limited extent. Change in you comes through your efforts to learn what the teacher is teaching and to put it into practice. A guru is a special teacher, a person whom you see as an expression of what it means to be awake and present and who also has the ability to elicit such experiences of awakening in you (i.e., transmission). In addition, he or she may provide instruction in methods of practice and guidance in both life and practice. Such a teacher may place significant demands on you to help you work through conceptual, emotional or spiritual blocks that prevent you from deeper levels of experience. Change in you comes through your confidence (or devotion) to your guru. This allows a deep emotional relationship to form which becomes the means by which you open to deeper levels of experience. A priest is a person who, by virtue of his or her training, symbolizes a relationship with the spiritual, or, if you wish, the divine. Interaction with a priest is frequently highly ritualized, the ritual setting and roles providing an environment in which the patterns and prejudices of daily life are set aside and the priest can function for you as a representative of what you aspire to spiritually or religiously. Change comes through your trust in the ritual forms and using them to access what is in your heart. While there are many different approaches to therapy, the aim in therapy is to heal. Thus, a therapist helps you to heal from emotional or psychological wounds that you may have incurred in the course of your life. The therapist provides a healing environment, a place where old hurts can be touched, without your being re-wounded. Change comes through the power of the emotional connection you experience with the therapist. He or she supports you, through presence, attention, and caring, in revisiting old hurts so they can heal. A coach is person who helps you change the way you behave, with the aim of making the way you do things more productive, more satisfying, less problematic, etc. A coach may well overlap with a teacher (teaching specific skills) and with a therapist (addressing to some extent the emotional issues that prevent you from changing your behavior). Change comes from your being willing to experiment with the different behaviors that your coach suggests and to see what works and doesn't work for you. A consultant is a person who helps you solve a problem by bringing greater depth and breadth of attention, experience and/or knowledge to the problem at hand. The challenge for the consultant is to avoid being relegated to an ineffectual role (the hand-holder) or being held responsible for the problem if it can't be resolved (the scapegoat). Frequently, the consultant seeks to move to the teacher role in order to help his or her client see the problem (and hence the possible solutions) differently. Change comes from your working with a consultant as a partner, combining his or her knowledge and experience about similar problems with your knowledge of the particulars of your problem. A mentor is a person who has considerable experience, knowledge, and wisdom which he or she makes available to you. Where you learn specific areas of knowledge from a teacher, you learn how to implement that knowledge, how to live it, from a mentor. A mentor may also guide you in your path, in your career, for instance, but more generally, in the area of experience of the mentor. Change in you comes from your listening carefully to your mentor's experience and from the mentor creating opportunities for you to grow and develop. A preacher is a person who moves you emotionally, evoking such emotions as love, fear, awe, or joy through his or her words and presentation. A preacher typically works with groups, often large groups, speaking to them in such a way that they are moved emotionally, inspiring them to go beyond what they ordinarily think themselves capable of. Change comes about either through faith (opening to new possibilities) or belief (solidifying one's convictions) in the preacher or what he or she is saying. A guide is a person who knows the territory, is able to find a path, and protects you, as much as possible, from danger on the path. A guide is a good person to be with when you are going into to territory that is unknown or unfamiliar to you. Think of a river guide, or a mountain guide. Change comes from following your guide's directions, not striking out on your own, but absorbing and learning from your guide until you know the territory and its challenges and can be guide yourself. Now, what are you looking for in a teacher? I am in touch with my wounded heart, not a victim! just experiencing fruits of my bad karma, combined with my current state of shock and awe, shielded with an exterior armour of frozen aloofness, as self protection. So, this is not a good time for me to seek a Teacher, perhaps not even a relationship, given my neediness. 1) Trust: upfront relationship.No games, because I am kind of dah!you know, a country bumpkin,a simpleton. So, I prefer one on one, straight talk. 2) A Teacher MUST critique me but in the initial stages of our relationship, I would appreciate some sensitivity; i.e. I must have trust and feel psychologically safe;for eg, not being outrageously abused and insulted, (no matter how altruistic the intentions)in the public arena such as the work place. 3)Sensibly Firm but KIND approach works very well for me. On retrospection in my life, the people who influenced me the most, were tough but kind,upfront mentors from whom I learnt alot; i made good spiritual progress. 5)Well experienced and wise; willing to share their experiences, so i feel inspired. 6)Last but not the least, clairvoyance abilities work well for me but again the relationship must first be built on solid foundation of safety and trust, In my relationhip with myself, i am not ashamed of my imperfections; I dont like them, but I must be patient, (especially at this time, I am frozen). Besides, there's nothing to hide from the 3 Jewels. All that I would ask for is please: be compassionate and sensible, start where I am. The Buddha started out with defilements,so there's hope for me. I love how the question is posed, not what I need in a teacher but what I am looking for. 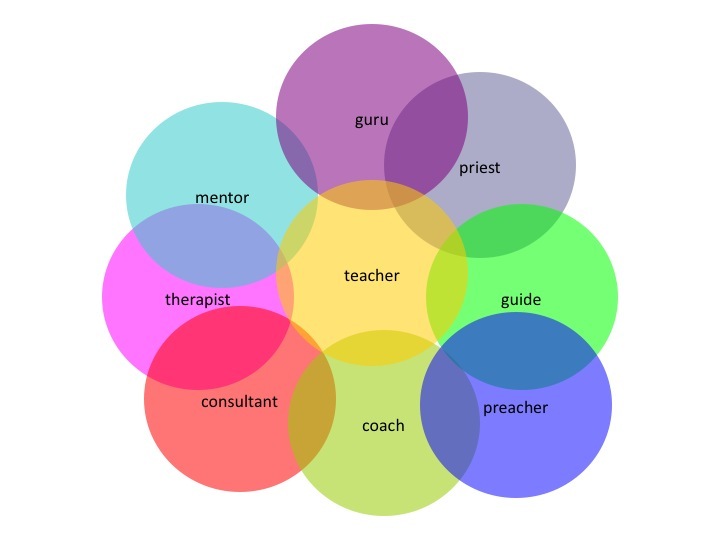 The descriptions of the roles are encompassing and the diagram represents how those roles can be overlapping and that such roles flow in and out from the center. Initially the answer I had at my fingertips was- it depends on the moment. A good teacher is able to tease out what is needed for the situation/conditions at hand and offer it up to the student. However that’s a description of what a good teacher is not what I am looking for. As you have said Ken, Emotions rule ! Yes, I want the teacher to help me learn but first I am looking for a teacher who can be present with me. An emotional connection . In Montreal at the Embodied Presence, Embodied Practice Workshop you did an exercise with us that had a element of that. Three people formed a group where one person questioned another person and the third person acted like a Buddha. In acting like a Buddha, you were not tense or stiff but rather soft and open. The third person ( Buddha) if they were able to enveloped the other two in the group with presence. After the exercise one person described how Buddha made them feel as if they were enwrapped as if they were in a hug. They even used their arms to demonstrate a large circle emanating from the body. For me it was being enveloped by compassion and lovingkindness. That aspect ( being enveloped by compassion and lovingkindness) is what I am looking for in my teacher why I say I want them to be present with me. No matter what I dish up on the other side, my teacher will have the ability to stay with me. The caveat with that is that when they are present with me they will also become aware of the very things I hide from myself. Thank you. This is a very useful framework.